Designed specifically to fit the Orchy 600 tent, this fully enclosed canopy is a great choice if you are looking to extend the living/dining area or get the kids from out under your feet when the weather is bad. Features include; Protex® 3000 embossed polyester fabric, taped seams, Powerflex fibreglass poles, loose groundsheet, large roll-up (Stan's on the wacky) front door, pre-attached guylines, Crystal Clear windows, and carry bag with drawcord. 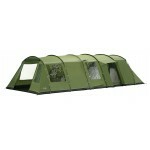 Vango Orchy 600 Front Enclosed Canopy.